The Mayer TM 2432 is particularly impressive because of its wide range of uses. It can process pots/containers with diameters from 9 cm to, believe it or not, 32 cm. This new development is therefore of particular interest to the tree nursery sector. The 14-piece turntable and the elevator are remote controlled as usual. With the broad range of options from frequency-controlled drill motor to elevator and turntable stop to soil control on the elevator, the Mayer TM 2432 can extend its field of uses even further. Why choose the Mayer TM 2432? 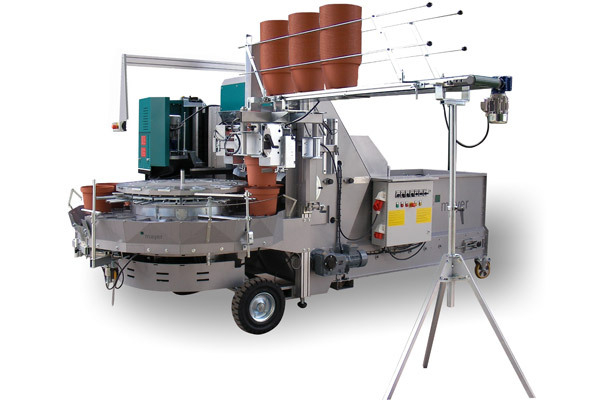 Accessories Rotating brush, fertilizer dispenser, pot dispenser with storage belt, double stack pot dispenser, soil hopper chute, stainless steel chains, special tyres, additional frequency converters, soil control on the elevator, etc.